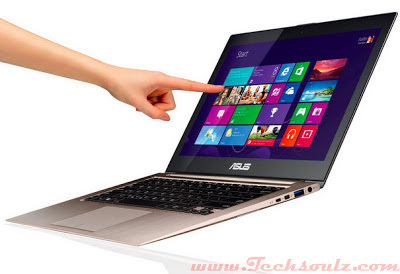 Following the release of Windows 8 last year, ASUS has responded with new products that take advantage of this touch-centric operating system. From its Zenbook lineup, the UX31A gets an update with the release of the Zenbook Touch UX31A. Building on the success of the “Zen” design, this Ultrabook sports the same brushed aluminum frame with Zen circles on its lid. The immediate difference one would notice is that this model employs a touch-capable Full HD display to take full advantage of Windows 8. Other than that, it still carries the positive aspects we’ve seen on its predecessor – its light weight (1.3kg), thinness (3-18mm), and premium build quality. Its extreme thinness is achieved by compromising its ports. You won’t be getting regular Ethernet and display ports, but worry not as you still get them via included dongles. Aside from that, you have two USB 3.0 ports, an SD card reader, and a 3.5mm audio jack combo. Going over its keyboard, we see the same backlit island-style design which offers enough travel for comfortable typing. As for its clickpad, it seems to have been updated, as we found it to be easier to click and more responsive than the one found on the Zenbook Prime UX31A. It also allows for typical Windows 8 gestures. One would surely enjoy photos and videos on its IPS display due to its vibrant color reproduction and great viewing angles. Adding to that is sufficient power from its speakers to make it hearable in a mid-sized room. The sample unit we played around with came equipped with a 1.9GHz Intel Core i7-3517U, Intel HD Graphics 4000, 4GB of DDR3 memory, and a 256GB SSD. Given this set of hardware, it provided us with more than acceptable performance in our tests, as it scored P665 marks on 3DMark 11, 3903 marks on the new 3DMark, and 5061 marks on PCMark 7. Benchmarks aside, this Ultrabook can readily handle daily office work, multimedia consumption, and a bit of gaming on the side. Ultrabooks are known for their battery life, so to test the Touch UX31A’s stamina, we ran Powermark and a 720p video loop test. On Powermark, it lasted for 198 minutes with continuous usage simulation, and for our loop test, it lasted 269 minutes. The 1080p display definitely adds up to the system’s power consumption. Not minding its price, the ZENBOOK Touch UX31A is definitely an Ultrabook to consider with its stylish body that houses enough performance to enjoy modern-day content.